Home / Publications / Health Research Priority Setting: A Duty to Maximize Social Value? Health Research Priority Setting: A Duty to Maximize Social Value? 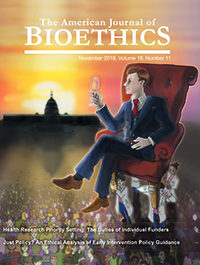 Leah Pierson and Joseph Millum’s article “Health Research Priority Setting: The Duties of Individual Funders” (2018) tackles an important question that has not received the attention it deserves from bioethics scholars: How should funders of research set priorities among competing research programs? Pierson and Millum make considerable progress on this problem, introducing a number of conceptual distinctions that helpfully carve up its various subquestions, and articulating and defending a reasonable set of solutions to them.